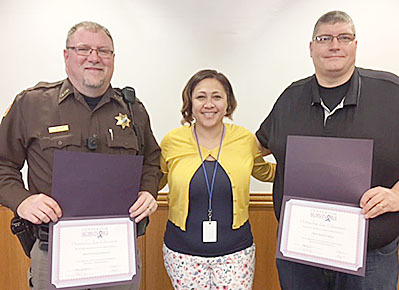 Angela Kelani of the Center for Survivors with Sheriff Denny Johnson, l., and Albion Police Chief Brent Lipker, r.
Special awards for outstanding law enforcement were presented to two local law enforcement officers last week in appreciation for their continued support, commitment, and dedication. The Center for Survivors of Domestic Violence and Sexual Abuse, Columbus, presented the awards to Boone County Sheriff Denny Johnson and Albion Police Chief Brent Lipker. Presenting the awards was Angela Kelani of the Center for Survivors.